This book is a culmination of what I've learned. I hope it will open the door for you to embrace your humanity, accept uncertainty, and live a life of gratitude. 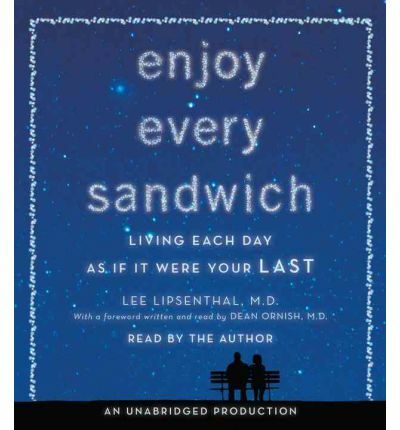 --from "Enjoy Every Sandwich "As medical director of the famed Preventive Medicine Research Institute, Lee Lipsenthal helped thousands of patients struggling with disease to overcome their fears of pain and death and to embrace a more joyful way of living. In his own life, happily married and the proud father of two remarkable children, Lee was similarly committed to living his life fully and gratefully each day. The power of those beliefs was tested in July 2009, when Lee was diagnosed with esophageal cancer. As Lee and his wife, Kathy, navigated his diagnosis, illness, and treatment, he discovered that he did not fear death, and that even as he was facing his own mortality, he felt more fully alive than ever before. In the bestselling tradition of "Tuesdays with Morrie, " told with humor and heart, and deeply inspiring, "Enjoy Every Sandwich" distills everything Lee learned about how we find meaning, purpose, and peace in our lives. "From the Hardcover edition." About the Author: LEE LIPSENTHAL, M.D., ABIHM, was an internist, trained in the prevention of heart disease and in integrative medicine. A popular and acclaimed speaker and author, he was the medical director of Dean Ornish's Preventive Medicine Research Institute for a decade and has also served as president of the American Board of Integrative Holistic Medicine. From the Hardcover edition.